In many respects, the standard-bred resembles its ancestor, the thoroughbred. 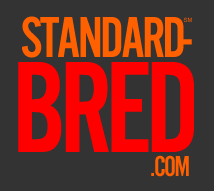 The term "Standard-bred" was first used in 1879 and refers to the speed standard required for entry into the breed registry. 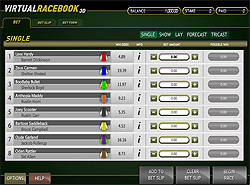 Standard-breds average 15.2 hands, smaller than the average thoroughbred, but have longer bodies. The head is refined but is rather plain, and set on a medium-sized neck that is proportional to its body. The quarters are muscular yet sleek. The clean hind legs are set well back. Individual standard-breds tend to either trot or pace. Bay, chestnut, brown and black are the predominant colors of standard-breds and they weigh between 800 and 1,000 pounds. In America, over 30 million people are attracted to standard-bred racing, more commonly referred to as harness racing. The American standard-bred is by far the fastest horse in harness, and the most popular trotting/pacing breed. Standard-bred racing is contested on two gaits, the trot and the pace. Trotters move with a diagonal gait; the left front and right rear legs move in unison, as to the right front and left rear. Pacers, on the other hand, move the legs on one side of their body in tandem: left front and rear, and right front and rear. This action shows why pacers are often called "sidewheelers." Pacers account for about 80% of the performers in harness racing, and are aided in maintaining their gait by plastic loops called hobbles, which keep their legs moving in synchronization. Europe has more trotters, while USA has more pacers. 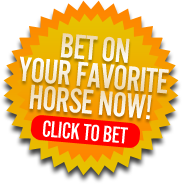 Today, harness racing is primarily centered in the Northeast and Midwest United States. Virtually every major population center in these areas boasts one or more major tracks. Several smaller towns also host harness tracks. The sport is also popular in Florida, California, and throughout Canada. Not surprisingly, the sport's premier track, the Meadowlands, is located within 15 minutes of New York City. The modern plant plays host to the Hambletonian, the sport's premier race each August. The standard-bred horse was founded on Messenger, a thoroughbred that was imported from England in 1788. He didn't race in harness. The foundation sire was an in-bred descendent of Messenger named Hambletonian 10 who was foaled in 1849. Like Messenger, Hambletonian 10 never raced in harness, either. His conformation was what contributed most to his success as a sire of harness racers. He was 15.3 1/4hh at the croup, and 15.1 1/3 hh at the withers. This build gave the propulsive thrust to the hindquarters. The first standard-bred races were contested along roads, with men challenging their friends to see who had the swifter steed. Often the streets of major cities were cleared and races conducted. Hence, so many American cities have a Race Street. © 2005-2017 Standard-Bred.com may link to third party websites and software, including additional promotional links. We do not endorse, and are NOT responsible or liable for any third party content, products, or services available from such websites. Online gambling may NOT be legal in your jurisdiction. Do NOT gamble online unless you have verified that it is legal for you to do so.